If you still do not believe yourself when you read the heading of this article, better start believing! According to some Power Consumption tests carried by Phoronix using their Phoronix Test Suite has revealed some very interesting stats about power consumption in the all new Ubuntu Lucid Lynx 10.04 and the Windows 7 Operating systems. 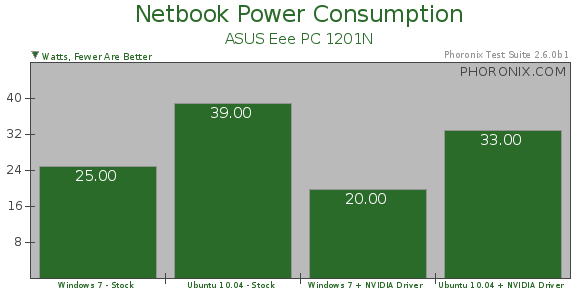 You can clearly see from the graph above that Windows 7 consumes less power than Ubuntu Lucid Lynx 10.04 for both the cases - with and without the graphics card driver. The test machine used here was a Netbook - The Asus EEE Pc. 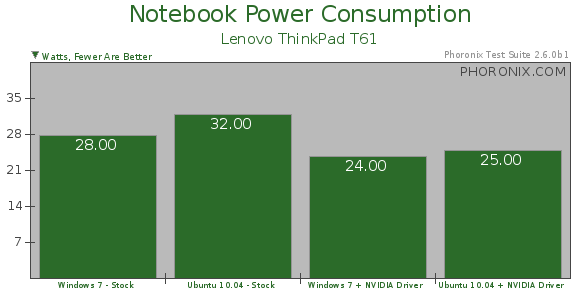 Similarly, when you look at this graph below, you can see that Windows 7 again consumes marginally less power than the Ubuntu Lucid Lynx for the same Power Consumption test carried out on the ThinkPad T61 notebook. The detailed review, Test and analysis can be read about on the Phoronix Website.